With Christmas fast approaching it means it’s time for mince pies, Christmas carols, tinsel, Santa Claus and of course Christmas jumpers! As part of St David’s Hospice’s ‘Jolly Jumpers’ campaign throughout November and December we want to see the best (and worst) Christmas jumpers on display across North West Wales. If everyone taking part donates a minimum of £1 then that would make a huge difference to St David’s Hospice. St David’s Hospice delivers specialist palliative care to adult patients living with advanced illnesses in North West Wales. The hospice also offers highly dignified, end of life care to those with shorter life expectancies. 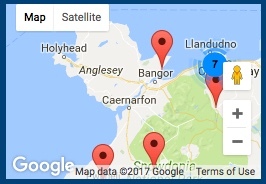 Every year, our work touches the lives of more than 1,000 people within our local communities across the counties of Conwy, Gwynedd and Anglesey. In 2017, it has cost £3 million to fund the hospice; unfortunately only 14% of this is figure is funded by the Local Health Board which leaves the enormous task of raising in excess of £2.5 million per year through voluntary contributions and the work of the fundraising team. We would be extremely grateful of your support if you joined us and became part of this campaign and this welcome pack will give you all the support you need. Not only would it raise the invaluable funds we require in order to continue our work and secondly, for raising the awareness of our work within the communities we serve. If you do decide to join us, please send us photos of your ‘Jolly Jumper Day’ to james.wilde@stdavidshospice.org.uk.